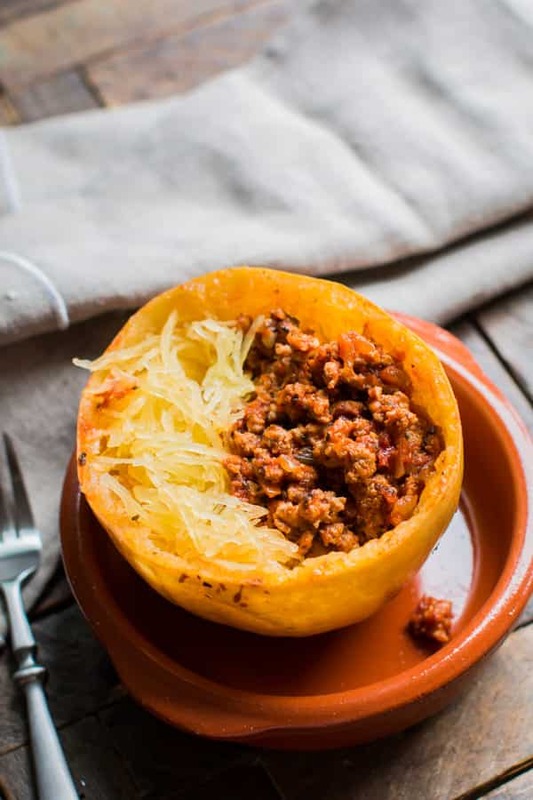 Slow Cooker Spaghetti Squash and Turkey Meat sauce is an easy and healthy meal to put together. In the last few months I’ve seen a few recipes for meatballs and spaghetti squash in the slow cooker on Pinterest. I wasn’t in the mood to make homemade meatballs nor to eat frozen style meatballs. 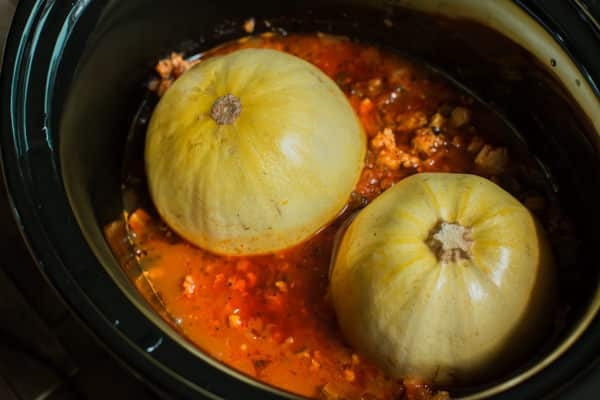 I made a quick and easy turkey meat sauce in the slow cooker, then put the spaghetti squash right in the slow cooker and cooked for 4 hours on high. 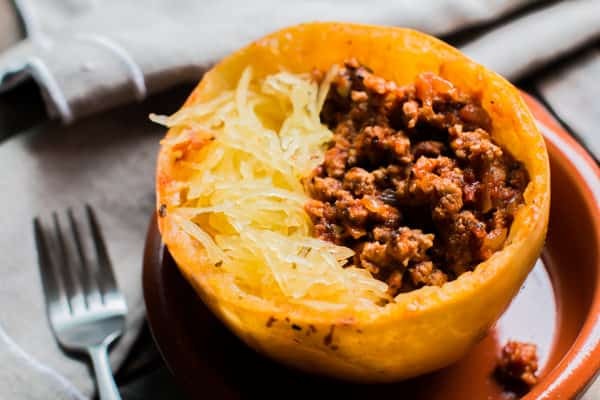 Mind you I have never had spaghetti squash, I didn’t realize how much I would enjoy this. 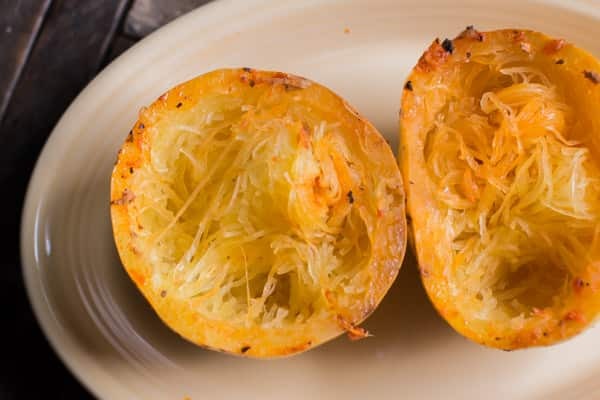 Maybe the cook time was just right to make the spaghetti squash “noodles” not mushy. My daughter couldn’t believe that spaghetti comes from squash, she thought it was a miracle! My husband and I had a good laugh about that. It was a fun thing to make for dinner that is actually healthy too. See the squash below? When I plated dinner, I didn’t think there would be enough for leftovers. Then after dinner I went back and scraped the squash with a fork and more noodles came out, the noodles go all the way to the skin. 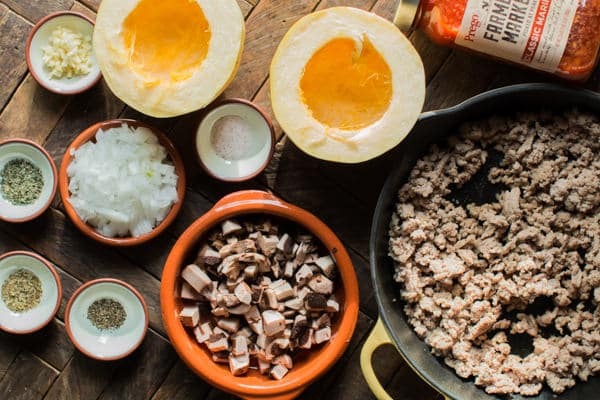 This meal could be served right in the spaghetti squash if desired. I actually made this plate up for leftovers, it slipped right into a round Tupperware. Here is my video of this meal, couldn’t be easier. You can follow me on YouTube, here. 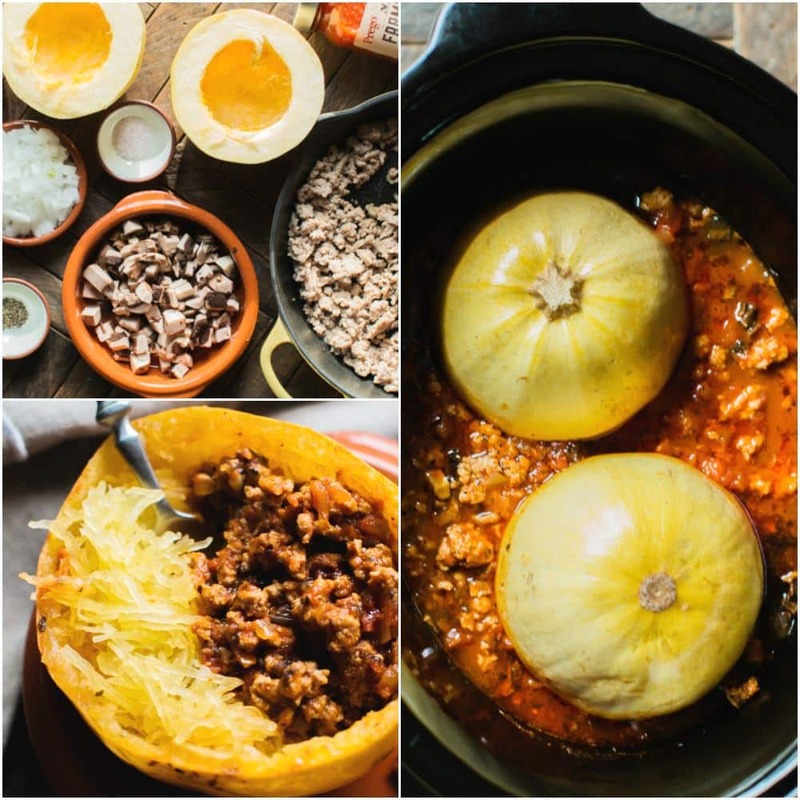 Kudos to whoever first did spaghetti squash in the slow cooker, best idea ever. I’ll be making this often! In a large pan on the stove-top set to medium-high heat, add cooking oil. Brown the turkey. Add to the slow cooker. Add the marinara sauce, mushrooms, onion, garlic, salt, pepper, oregano, and basil to the slow cooker as well. Stir. Nutritional values are approximate, please your own calculations if you require a special diet. 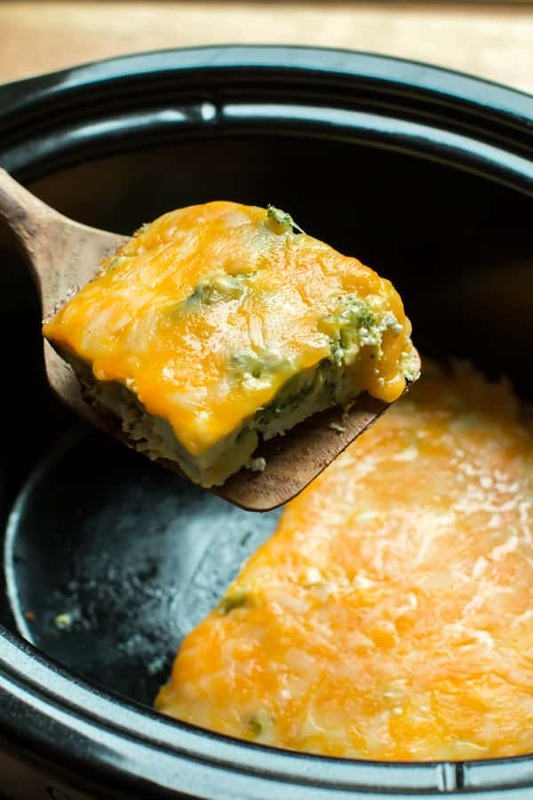 I used my 6.5 quart Touchscreen Crock-Pot® Slow Cooker for this recipe. Though any slow cooker 6-quart or larger would work fine. 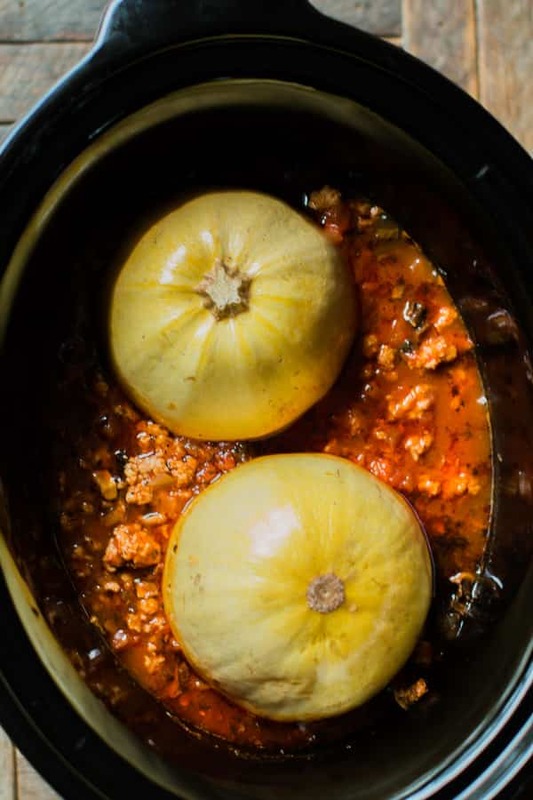 More tasty slow cooker recipe here at Backroads Living. The taste is amazing and is not that hard to make. Thanks for sharing! Can you cook on low? For how long would it be? I have not tried. I’m guessing 6-7 hours on low. OMG Sarah, I just made this for the second time today. So, so good AND easy! Set it at high for four hours and at three, my squash was ready. I took it out with 40 minutes to go. I used two large porabella mushrooms, about a half eggplant, baby carrots and a whole onion…all chopped in good size pieces since they give off so much liquids. Used ground turkey from Costco and #99 traditional marinara from Trader Joes…I did add a few shakes of pepper flakes…this is seriously good stuff. Thanks so much…I thought it needed to be put over rice…nope…great just the way it is. 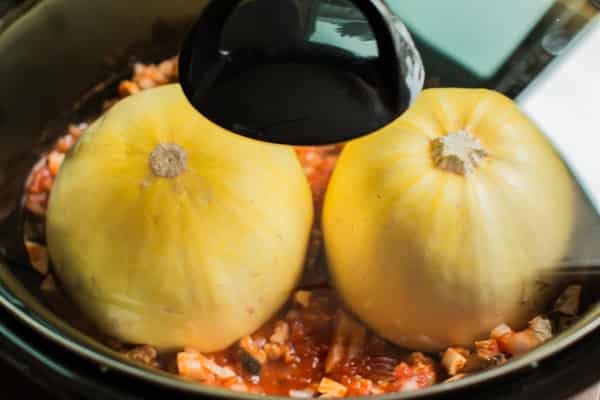 Great way of cooking a Spaghetti Squash. That’s awesome. I like what you did with the recipe! I was shocked myself how great the squash tastes in this. and it turned out absolutely yum! Is there any reason beef shouldn’t work? I’m working on getting on my site this month. Thank you for your patience with me! Do you have the nutritional details yet? Hi Jean, I just added them for you. They are right below the recipe. Any idea how long this would take in an instant pot? Just finished making this…it was amazing!!! I used ground beef, no mushrooms and onions…it was super easy to make..added a garden salad..my 20 year old son loves it….I will be making this quite often. Can this be made then put in the freezer? I’ve never froze spaghetti squash??? I have not tried, has anyone else?